Ceiling water stains are more than just an eyesore. A water stain on the ceiling means water has found its way into the attic or the space between the upper and lower floors. Before any attempt at repair can be made, the source of the moisture has to be found and repaired. 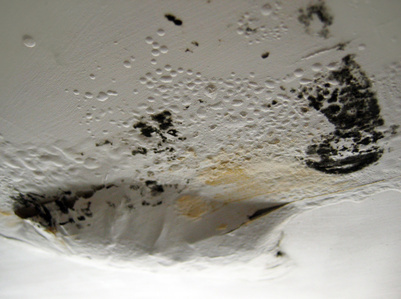 Water stains on the ceiling can be caused by moisture from any number of sources. To help in finding the water source, consider whether the leak occurs only during a rain storm or periods of extreme cold weather. A ceiling water stain near the edge of an outside wall may indicate a roof leak such as water backing up from an ice dam in cold, winter weather or a damaged roof drip edge. Roofs are a common source of leaks. Water can travel down a roof, ending up as a pool of water on the ceiling, where the drywall becomes saturated and a stain or drip results. Check for leaks around chimneys, ridge vents, bathroom vents or anyplace something protrudes through the roof providing a place for water to leak. Check carefully; water can enter near the ridgeline and travel down a rafter before dripping down to the ceiling. Water leaks in the attic are commonly caused by leaks in the roof, overhead plumbing or central heat and air units and their plumbing. Check for leaks anywhere you find a water supply or drain pipe. Watch for places where warm, moist indoor air comes into contact with cold air in the attic, creating condensation. Condensation dripping from air conditioning ductwork can cause water damage and promote the growth of mold and mildew in the attic. Drywall water damage in the ceiling of ground floor rooms can be caused by leaks from upstairs bathrooms. Check to see if the leak might be found in a bathroom, especially from a sink, toilet or bath tub. Caulking around bath tubs can leak, as well as the drain pipe, and cracks in the floor pan of a shower unit can cause water to seep through the floor. Check for leak damage in sink cabinets and on the floors around toilets where a seal or supply line can cause a slow leak. When the damaged area is dry, scrape away any loose pieces and use a razor knife to cut away the drywall tape and prevent further damage to the ceiling. Sand down the rough edges, apply new tape and use a wide-blade drywall knife to apply drywall compound to the damaged area, feathering the edges as you go. Once dry, sand the area and apply more compound if needed. When the repair is dry, you are ready to paint. Use painter's tape to protect areas around the drywall repair. Ceiling water stains should be painted with a stain sealer or primer to prevent the water stain from bleeding through the new paint. Allow the first coat to dry and apply more coats of sealer as needed. Choose a ceiling paint that matches the color and gloss of the old paint and use a brush to paint the repair or a roller if you want to paint the entire ceiling.